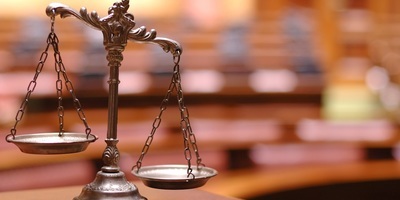 A federal grand jury sitting in U.S. Virgin Islands returned a 35-count superseding indictment against James Auffenberg in connection with a fraudulent tax evasion scheme involving the abuse of a Virgin Islands economic development program. Judge Stack Madison County Circuit Judge Daniel Stack closed more than 200 asbestos suits Oct. 12, as attorneys dumped cases they didn't care to pursue any farther. Jensen Madison County jurors appeared deadlocked Thursday after more than a full day of deliberations in a wrongful death trial against Rosewood Care Center of Edwardsville. Kevin W. McClain Investigations, Ltd., a full-service investigative and consulting firm with offices in Illinois (Centralia) and Indiana, has expanded to the Metro-East. The next meeting of People in Business will be held at 8:30 a.m. on Oct. 23 at GC Cuisine in Edwardsville. A Troy Police officer who was accused of yanking a door so hard at a local Pizza Hut that it injured an attorney was dismissed from a lawsuit by Madison County Circuit Judge Nicholas Byron on Oct. 5. Lotawata Creek Restaurant in Fairview Heights Six black ordained ministers claim a Fairview Heights restaurant discriminated against them after a member in their group was told he would have to pay for lemonade if he wanted extra lemons in his water. Judge Crowder MOUNT VERNON – Madison County Circuit Judge Barbara Crowder correctly rejected a Lakin Law Firm bid to dismiss a legal malpractice claim, Fifth District appellate judges decided Oct. 9. Craig Jensen After three long days of deliberations, a Madison County jury sided with the family of Rosewood Care Center resident Margaret Schwab, but only awarded it $58,000, a fraction of the $1 million in damages they requested. It's been about 21 months since Jeffrey Lowe launched his Madison County-based crusade against the U.S. mini-blind industrial complex, and the prolific local plaintiff's lawyer is still fine-tuning the aim of his accusations. BELLEVILLE - St. Clair County Associate Judge Andrew Gleeson has transferred to Madison County circuit court a defamation suit that disbarred attorney Amiel Cueto filed against the Madison County Record. A terminal manager for Alton & Southern Railway filed a personal injury and Federal Employers' Liability Suit against her employer and Timothy Dobler in Madison County Circuit Court Oct. 17, seeking damages in excess of $100,000 for injuries she received during a traffic accident on Jan. 13, 2006. Walter Kot of Illinois filed an asbestos suit against 49 corporations alleging he was exposed to asbestos while working from 1940 to 1980 as a laborer, firefighter, forester, sheetmetal worker and shipper at various locations throughout the state. A man who purchased a lawn tractor for $3,200 at the Edwardsville Home Depot filed a defamation suit against the nation's second largest retailer alleging he was accused of shoplifting even though he had receipts for the purchased items. American Freedom Mortgage in O'Fallon A local mortgage loan company is the target of a new class action lawsuit claiming it violated the Telephone Consumer Protection Act for using automated telephone dialing equipment to deliver pre-recorded promotional messages to residences. A former Schnuck pharmacy technician has filed a wrongful termination suit claiming she was discharged Feb. 21 for incorrectly ringing up an ineligible food item as a food stamp purchase. Tina Pratt of Dupo is suing Crystal Noethen over a St. Clair County auto accident earlier this year in which Pratt sustained serious injuries. A St. Clair County plaintiff claims her use of a transdermal contraceptive patch caused her to develop deep vein thrombosis. A St. Clair County woman claims her use of hormone replacement therapy drugs caused her to develop breast cancer. Former Speaker of the House Dennis J. Hastert this morning denied speculation that he would retire early from a seat he has occupied for 21 years in Illinois' 14th Congressional District.